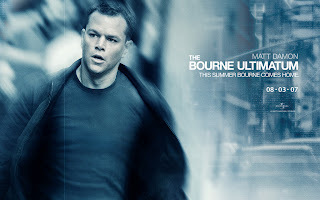 17 October 2007- Well, i watched this movie today - The Bourne Ultimatum. It's an action movie about a young man called Jason Bourne a.k.a David Webb. Jason Bourne still suffers from bouts of amnesia. The one thing he does remember is that there are people who want him dead. See, the CIA who trained him to be a killer, are still after him. In a way, he's still after himself; Bourne's not all too clear about his identity. So when a reporter offers to help him put some pieces together, Bourne comes out of hiding. But who's good at finding people when they're not hiding? The CIA! And another new organization that wants Bourne dead too! It's a pretty clear ultimatum: Travel across the world to find out who you are, and then get away or get killed. The story line is interesting and there's action and fighting moves in the movie. I will give a 4 out of 5 stars for this movie.